The Cowburg Cow has been taken down temporarily in order to protect it from Hurricane Florence. Click to see a video of Bessie’s removal, taken September 10, 2018 by Tammy Ingram. This beloved bovine, spinning beneath a giant neon “C,” is one of the most famous landmarks in Charleston. 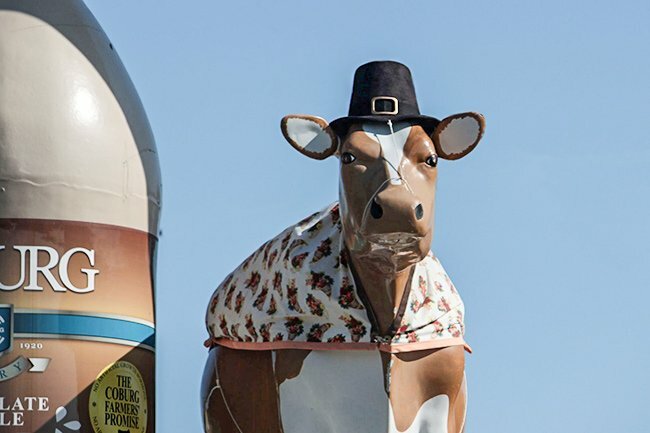 Not only does the life-size cow loom over Savannah Highway (part of US 17), but she also spins, providing a temptation many have found hard to resist. Erected in 1959, the Coburg Cow – often called Bessie – has regularly suffered damage from people riding on her back or breaking off her tail as a souvenir. Yet because she is such a popular icon, she has been continuously repaired and reinstalled. The Coburg Dairy Company was established in the early 1920s just down the road from the sign. A blinking neon sign in the shape of a cow was then hung on the corner of Savannah Highway and Coburg Road, where it remained until 1950. 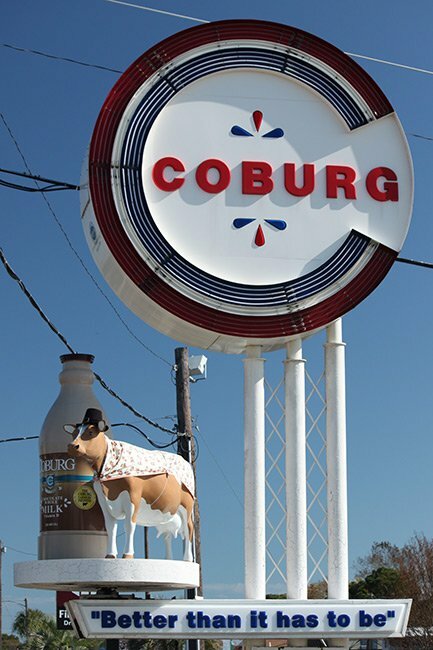 That year, it was replaced with a different sign that said “Coburg Dairy” and featured a cow standing on top of the dairy’s name. This sign served the business for nearly a decade, until it was usurped by an innovative and eye-catching three-deminsional version in 1959. Shortly after the 100-pound cow was installed, young rustlers began climbing her platform, which stands eight feet above ground, and using her as a merry-go-ride. Although illegal, the stunt became a tradition for some. Cowburg Dairy’s former owner, Frank Hankel, said two people were arrested over the years – including his own daughter! In September of 1989, news arrived that Hurricane Hugo would make landfall near Charleston. The cow was taken down and safely stored; the rest of the sign, however, was destroyed. Roberts and Sons Signs, which has maintained the sign since its inception, repaired it following the storm. By 1991, Bessie was back in business – though not for long. In 1992, the cow suffered her biggest catastrophe yet when a cadet from The Citadel, Roy Maybank, fell off during an illicit ride on a raucous Halloween night. Both the cadet and the cow were injured, and the cow was once again removed for costly repairs. Following a fundraising effort by Citadel cadets (the price tag was about $4,000), Coburg Dairy and The Citadel held a restoration ceremony, complete with bagpipes and a 21-gun salute. This time, Bessie was protected by a barrier, and at least one source says Bessie herself was replaced at this time by a stronger model. 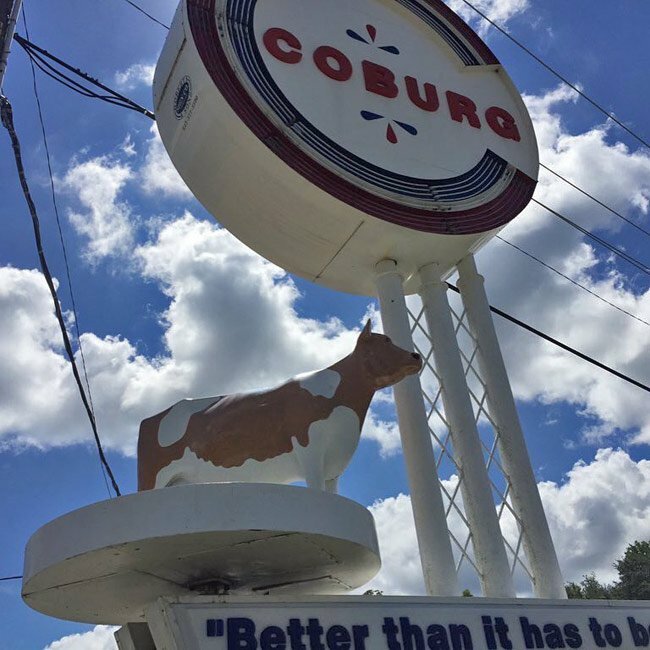 Coburg Dairy relocated to North Charleston in 1990, but Bessie stayed behind. In 2001, the historic landmark was found to be in violation of ordinances prohibiting off-premise signs and limiting their height. The City of Charleston’s Board of Zoning considered putting the old girl out to pasture, but the West Ashley community where she resides rose to her rescue, signing petitions and attending a meeting on her behalf. As a consequence, Bessie was spared and remains in her original location. 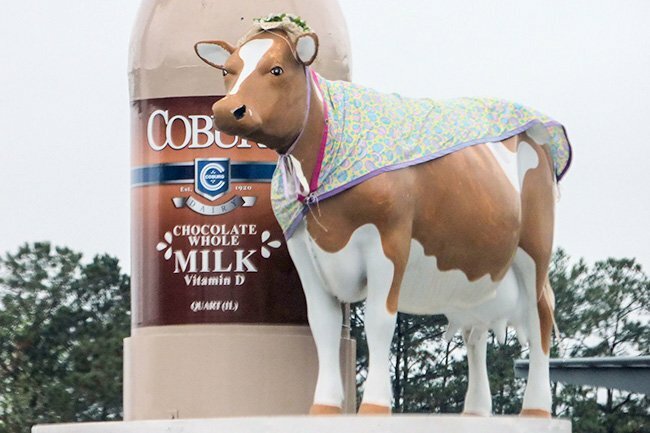 The sign’s most recent threat came in 2011 when Borden Dairy Company purchased Coburg. Locals feared a name change for the cow was imminent, as Borden is a national franchise with a cow of its own – Elsie. Luckily, Borden recognized the sign’s significance and pledged to leave it intact. This is not to say the cow doesn’t undergo change. She has a red-and-green body double that is used during the holiday season, and the regular brown-and-white version is often seen dressed in costumes. Bessie wears a cap and gown in May, a bonnet at Easter, and a white sheet for Halloween – complete with two holes cut out for ghostly eyes! 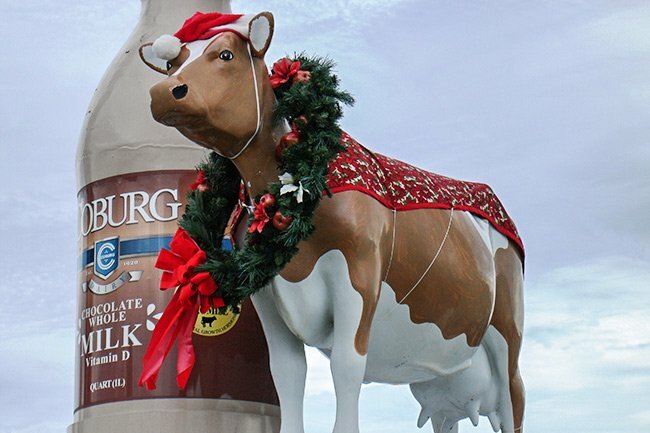 The bottle of chocolate milk that stands by her side weighs 150 pounds and is replaced by eggnog at Christmas. While Roberts and Sons Signs did not create the cow, the company does maintain it. It also manufactured the modern chocolate milk bottle that replaced the carton. The breaking of her tail by vandals is a persistent and expensive problem, and thus she often sports only a stub. Mr. Hankel notes that while Bessie is not an official name, it is by far the most common. That said, fans are welcome to assign appellations of their own! Update: Bessie’s bottle was blown down by a storm in July, 2016. It will soon be repaired and replaced, but that is why it is not shown in the image above. The sign itself was made by the original Roberts Neon Service, in 1959. The cow was ordered by the owner, at a place for the design of the cow. The design and manufacturing of the sign itself was an original of Lloyd Earl Roberts. Hi, Phyllis. Please contact someone from Roberts and Sons to help with your request. Here is the website: http://robsignco.com/ Best of luck! Dear Sir: On Jan 28, 2017, the newly developed Dorchester County Museum was opened in St.George, SC. I am interested in adding a “Farm To Table Exhibit.” I need a cow. Is there anyone within your company that I could speak to about setting up an exhibit? One town in DC was considered “Dairy Capital” in 1930s.